RESCUE TECHNOLOGY warrants the original purchaser that products manufactured and/or sold by RESCUE TECHNOLOGY will be free from defects in materials and workmanship. This expressed warranty and all implied warranties imposed by law are limited to one year duration from the date of purchase. RESCUE TECHNOLOGY will repair or replace any product returned under warranty if, in RESCUE TECHNOLOGY'S judgment, the product has not been misused or altered. No further warranties exist or are implied by RESCUE TECHNOLOGY due to the high risks involved in rescue services and in out activities such as, but not limited to, mountaineering, rock climbing, rappelling, or caving, which can be reduced only through the skill, training and judgment of the individual participant. RESCUE TECHNOLOGY shall not be liable for any and all consequential damages arising out of the breach of the expressed or implied warranties on sales by RESCUE TECHNOLOGY products. This limited warranty in no way limits or alters other manufacturer's warranties on products that are sold or distributed by RESCUE TECHNOLOGY. 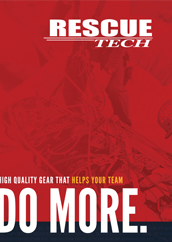 RESCUE TECHNOLOGY reserves the right to modify, without notice, the specifications and price of products described in our catalog or RescueTECH1.com and the terms of sale.